The end of my pantry goes under the stairs to the second floor. I HATE wasting valuable storage space so I decided to make good use of it by adding a wine rack. Of course that wasn't good enough, and in true Myst fashion, decided to make a Puzzle Lock to hide a secret compartment. I apologize for pictures only in the write-up. I tried uploading videos of this in action, but they didn't upload. I hope you enjoy my project. Some parts are over the top possibly, but lots of good ideas in here I think! 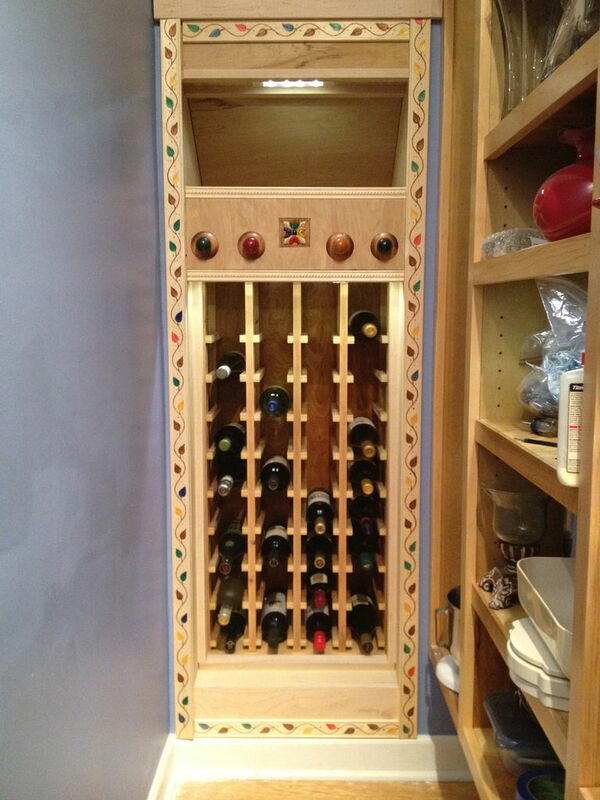 When the correct lever combination is set, you can now push the button in the middle of the levers causing the wine cabinet to slide backwards and reveal a hidden compartment. Of course you could just make a simple lock and have the same movement by the cabinet, but I was interested in making a lock that would challenge people to discover the correct combination. So this is the lock design. The 4 levers are used to prevent the middle piece of wood from moving unless all levers are set to the correct position. When they are and the button is pushed, the middle piece of wood moves back (towards the spring). This causes both "L" pieces to pivot and pull the wooden blocks that extend outside of the lock box inwards. Once they move in, the cabinet underneath is able to slide back. Step 3: How the Lock Is Made Pt1. I took a piece of Birch Plywood and routed out L shaped grooves into the wood to create channels for the levers to slide in. The wider grooves are 3 times wider than the wooden levers the knobs attach to. Well…there is an exception for the bottom one…I added a twist to my locking mechanism. I used a router for this and got the straight cuts by clamping wooden guides to the plywood to keep the router going where I wanted it to go. The first step is to secure the guides in place for the locking bars. Then the bars are fitted. The "L" shaped pieces are attached with wooden dowels. The length from the middle dowel to the dowel hole at each leg of the L is 2 to 1. I did this in order to double the movement of the locking bars as compared to the movement of the button. Dowels are added to the locking bars. Connecting pieces are placed onto the dowels for the locking bars and the "L" pivoting pieces. The locking bars are secured with 2 wooden cross pieces to keep them from jumping out of the guides. I tried using glue for much of the construction, but there were some places that screws would have made sense. I did use glue here, but it took several tries to make sure these cross pieces would stay attached because I had started to stain the wood as I went. duh. Next add 2 more dowels to the "L" pieces and install the piece with grooves that connects them together. I should have made a jig for these slots…I was getting impatient and thought I could drill 2 holes and then use a jigsaw to connect them to make these two slots. It worked… sort of, but the grooves were less uniform than I would have liked. By now it was becoming obvious that this was handmade, I had to allow for some tolerances due to pieces being slightly different between the left and the right side. Hey, it is a one-off project, right? So jut trim and keep testing as you go. The important thing is to keep testing the pieces and make sure they don't bind. Next you add the "push bar" that attaches to the back of the button. I had to cut a notch into it so that it would attach to the underside of the piece that connects the "L"'s. The push bar also has small notches where it crosses each routed groove. The notches in this piece of wood are just as deep as the ones in the plywood (they mirror their length and depth). Each notch half then makes up an opening big enough for the square levers to slide through. The back of this push bar also has a hole drilled into it that goes about 3 inches in. Once the push bar is complete, a reinforcing braced is installed to keep the main pivoting dowels in place when the push bar is well, pushed. There are a couple of steps in this next picture. I added wooden guides to either side of the push bar. They are attached by screws from the bottom of the plywood. Like the push bar, they have matching notches to allow the levers to slide back and forth. I also added a block of wood behind the push bar and secured it with two brass screws. There is a wooden dowel that connects this stopper block to the push bar…it goes into the hole in the push bar and acts as a guide. I added a spring on the dowel so that after the button is pushed, it will return to its original position. Also in this picture are the 4 levers shown installed. I'll discuss that next. The first step is to make the levers which are just simple "L" shaped pieces of wood. You can see in the picture how they fit. They are twice as high as the grooves they sit in. Although not pictured here, I did go back later and add some cross braces to the levers to improve the strength of the joint. Next I drilled indents into the wood as shown. I also cut grooves linking them together. On the underside of each lever, I added a wooden button plug. I did this so that there would be a definite feel when a lever was slid left or right, it would drop into one of the holes drilled in the previous step. I used threaded inserts in the ends of each lever. The balls at the end of the levers screw into these inserts. Now that you have the levers in place, you need to set the combination. The Push Bar will never move back if there aren't grooves cut into the levers. So remove the two guide rails along side of the Push Bar and set the levers in the position that you want them to be to unlock the puzzle. Make sure that the levers are sitting in one of the indentations you put in the plywood! You can then mark the lever on either side of the Push Bar (where it goes through the opening). Remove the lever and cut a notch out of the wood so that it is flush with the plywood. In the pictures you can see the notch cut in the lever (not the guide bars have been reinstalled). The first picture shows the lever all of the way to the left, the second picture shows the lever in the middle position. When moved to the right most position, the notch will line up with the Push Bar (an allow it to move back). I then added a front panel to the lock so that the mechanism was hidden from the front. I cut grooves in this panel so that the knobs attached to the levers could slide back and forth. I also cut a square hole out of the middle and attached it to the end of the Push Bar. The hardest part is checking and rechecking clearances. I struggled to get the button to slide easily in the opening in the front panel for some time. Just when I got it to fit and glide smoothly, I messed up the tolerances when I added polyurethane. Be patient! This write up is really about the lock and not so much how the cabinet moves. I don't plan on going into detail on it's construction, but basically the wine cabinet is a box mounted to a platform on sliders. I use a commercial door closer (found at a local home improvement center mounted underneath to pull the cabinet backwards when the locking bars retract. Not the prettiest, but I have the blocks shown in the picture mounted to either side of the cabinet. This is what catches on the locking bars and keeps the cabinet from moving until the button is pushed. One modification I realized I wanted was to be able to pull the cabinet closed without having to hold the unlocking button down. So I removed the locking bars and shaped a curve into the backside. Very similar to what you see in a regular door latch. I also added a switch so that when the cabinet went back all the way it turned on a light in the hidden compartment. If you want to figure out the puzzle, study the picture closely. The answers are all there along with one physical fact, only the BLUE knob is loose. If you want the answer, then continue reading. The combination to get into the cabinet is shown in the leafed trim. Note the button to open the cabinet has 4 colors on it and a black dot in the middle. The placement of each knob (lever) is indicated by the direction of the color on the button and then found by looking between the black dots on the trim. Brown leaves are spaces and the colored leaf represents the placement of that particular knob. Example: Red on the button points down. Look at the bottom trim…It is tough to see but there are two black dots on it. Between them is a red leaf, a brown leaf and a brown leaf. That tells you the red knob should be set to the left. The tricky part? The Blue knob…it shows brown, brown, brown, blue… Remember the double lever…the loose knob? you have to unscrew the knob and move it to the right fork in the lever in order for the knob to move all the way to the right. One of these days I might forget the combination….I wanted a way to always remember it and what better way than to have it out in the open? Oh, and at some point I need to cover up the lock and put in a shelf. For now I enjoy watching it operate and showing friends and neighbors. So much for a secret door and compartment! Changing the L- joint for a gear and teeth; so that rotating the knob would move the pin left or right instead! This could be added to the current design even after being built, would give way more combinations. And has the added bonus that it could be changed (lift gear, slide pin, drop gear) in case anyone works it out by watching you! Just a thought, great as is though. That is an interesting idea! I like the thought of using gears and teeth. It might be tough to do this with wood, which is what I wanted to do for this puzzle, but I can see the possibilities for making more combinations. hmmm... you could effectively use just 1 knob to change several pins too it slid out and back. Ok, something to think about. I like that! I need to find an Intructable Geek for a husband! I can't even figure out how to upload my pic in the box to the left. Are you, or were you ever an employee of Krolmeister? If not, you would do well to seek employment with them. LOL. Krolmeister? Maybe I should be, but I am not. My daughter used to like playing those Nancy Drew games. They were more of my inspiration than Myst, but if I referenced, "Her Interactive" I figured less people would know what I was talking aboutt. Good sleuthing to know this is similar to those games! TracRat, you have amazing concentration, dedication, creativity, and excellent craftsmanship. Thanks so much for sharing this 'ible. My sister and I have just found flummox, an upstate NY geocache (GC62EK5), a codex-sort of thing that took us well over half an hour to open. Seeing that and then reading your detailed Instructable is increasingly leading me toward building some of my own. Thanks for sharing your work! This is such an excellent idea, Casey! My wife and I love the Myst series (must play them again, soon) and have made a few projects along their themes, over the years. Seeing your implementation of a hidden cabinet with all the elements of a typical Myst puzzle has persuaded me to do something similar. I came here looking for ideas to build a puzzle lock for a side door on a new garage I'm building (I hate having to fetch a remote or keys if I'm already in the garden and want to pop in to my workshop or the garage). I usually install my own electronic locks with a keyboard - but I have also made a puzzle lock for a gate that I needed to be able to open without electrics. When I retired, I treated myself to a decent-sized laser cutter, so I am able to make quite high-precision parts. If I do use your idea for my garage lock, I'll come back here and let you know. Well done - and thanks for publishing your project. I feel guilty for not having the patience to document any of my projects as an instructable. I'm so glad that you did! Thanks for the nice comments! I have a few long term projects planned that involve electronic locks, but if I have the time, I always prefer a mechanical solution. Using your laser cutter would certainly improve and perfect pieces for a lock. I spent a lot of time fitting and refitting parts because I was using hand tools. Please, let me know if you make a lock based off of this. I would be interested in seeing what modifications you come up with. As for posting instructables, the easiest way to get started is to take pictures with your phone as you create a project. I have several projects I have photo documented but later decided not to publish. It it easy to make an Instructable as long as you have pictures! I have also found that you can get a lot of the detail pictures of parts right before final assembly, so if you missed some things, you can get caught up. Anyway, thanks again! I have enjoyed sharing this idea and always welcome comments! Thanks! Sorry for this delayed reply, I just saw that you had made those nice comments! Well, the details were important to me. In a project like this, I wanted everything to have a reason for being there. Very cool! I love the nearly-all-woodwork approach. It is functional art, the best kind. Of course the downside is you don't get to see the woodwork, as all the complexity is hidden between the plywood sandwich. Not as fun to show off. That is not a bad idea about using an upper level for the knobs to get more combinations. You would definitely add complexity! I think my woodworking was decent for this, but I was worried that if it jammed, I wanted to get to it. I agree about not being able to look at it anymore either. I like to watch it operate. Plexiglass panel instead of plywood? Wow i love the way you thought about everything and actually made it. I have lots of ideas too but i just dont have the means, time, or money to actually make it. But you did and... wow... just wow... good job.